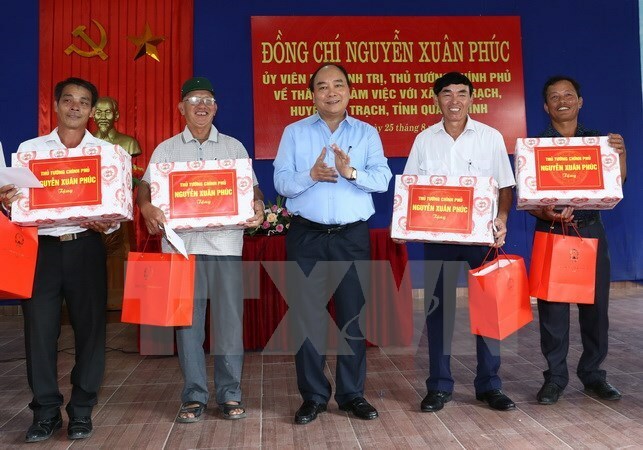 Quang Binh (VNA) – Prime Minister Nguyen Xuan Phuc has hailed coastal Duc Trach commune in the central province of Quang Binh for its achievements in new rural development and recovery from the marine pollution incident last year. More than two thirds of population in Duc Trach commune are in working age, mostly living on fishery, seafood processing and labour export. The commune is one of the leading localities in terms of compensation supply for victims of the marine incident caused by Taiwan’s Hung Nghiep Formosa steel plant. During a local working session on August 25, the PM suggested the commune considering a plan to switch to potential areas, especially tourism and fishery logistics. He called further attention to compensation for victims of the marine incident in the central region in line with legal regulations and the government’s policy. According to him, the government is interested in building a coastal road in the locality and connecting coastal localities together to facilitate socio-economic development and ensure national defence-security. The leader asked the provincial Party Committee, People’s Committee and political system to continue upgrading infrastructure and fully tapping fishery processing. In the first half this year, the commune collected nearly 4.7 billion VND (204,000 USD) for the local budget, or nearly 73 percent of the estimate. It has only 42 poor households, accounting for 2.26 percent of the total, and 453 fishing vessels with a total capacity of 155,300 CV, including 229 ones of more than 90 CV. It also pushed forward new rural construction at a total cost of over 34.2 billion VND, 59 percent of which was sourced from the local budget. Though being recognised as new-style rural area last year, it is working to continue meeting more criteria on cultural and school infrastructure, among others. The commune has so far spent more than 171.3 billion USD on compensation for victims of the incident. As many as 182 fishing vessels are expected to receive nearly 21 billion VND in aid. Earlier the same day, PM Phuc attended a ceremony to open Nhat Le 2 bridge to traffic. With a total length of 2,298m, the bridge was built at a total cost of more than 936 billion VND.